I want to tell the world about someone who is very special to me. She is good company, even when I am not. She understands that sometimes I just need to be left on my own for a while. She never scorns my humble creative efforts or heaps derison upon my dreams. She makes getting up in the morning worthwhile, and coming to bed at the end of the day bearable. She is not “the wind beneath my wings; she *is* my wings. She never berates me; nagging is a foreign language to her. She is my muse. When she is away from me, my creative spark is extinguished. She has taught me that it is often better to be happy than to be right. She doesn’t try to correct my driving. She just sits and quietly trusts. I love that quality about her. She always takes the lead… in respecting me. She makes God look so… winsome. She never complains to others about me. Added *nothing* to move the as-yet-incomplete story along. I don’t often discuss details of my personal life in this blog; it is intended to be a commentary on the currents of the culture and not the diary of a teen-aged drama-queen. Besides, I prefer to remain quasi-anonymous, as it makes it easier to concentrate on the issues. However, the subject of marriage — what it once was and what it has become — is one that is dear to my heart. Since I have been married just over twenty-eight years, this is a subject on which I have no small authority. I just finished reading “Men on Strike“, by Dr. Helen Smith, and was amazed at her ability to explain the current marriage crisis in plain English. While Dr. Helen refers to it as a “Strike”, it really isn’t; she uses the word purely as a theatrical flourish. The general theme of the book is that an increasing number of men in Western society are avoiding marriage; not out of coordinated political action (we leave that to the Feminists and their primary tool of weaponized nagging), but out of a simple rational decision process based on enlightened self-interest. In spite of this, I am still happily married to my first love — and my last romance — after nearly three decades. I was born and raised in England, growing up in the 1970s and 1980s. Possessing a unique and unusual cultural background, I didn’t really fit in with the cultural blocs in that society. As a result, I always felt a sense of isolation; I was not a social person (a shortcoming that has since been remedied), and found it difficult to meet people, particularly girls. Growing up, I had an uneasy feeling that I would not find a worthy wife in the land of my birth. to quote Treebeard in the Lord of the Rings: “I am not on anybody’s side, as no-one is on my side”. In my early twenties, I took a trip to the land from whence my parents came; a third world country that possessed idyllic weather, the finest beaches I have ever seen, and the most beautiful women in the world. While I was there, I spotted a hot nineteen-year-old, and with help from my family, I tracked, pursued and bagged that lovely creature, much to the chagrin of lesser mortals who thought that they were in with a chance. A year later, we were married. there were a total of nine people at our wedding. 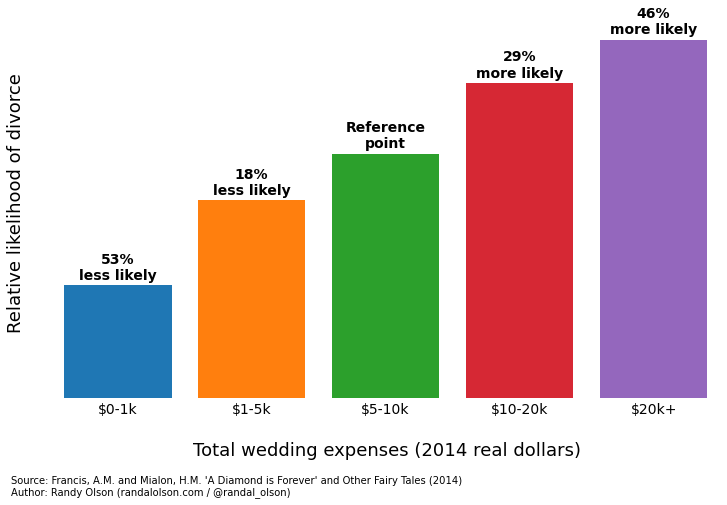 Some of you may sneer at that, but I really don’t care, because studies have shown that the more you spend on the wedding, the higher your likelihood of divorce. There might be something to that, because we just celebrated our twenty-eighth anniversary. I work, she stays home. That’s the way it is, and with respect to KC and the Sunshine band: “That’s the way (uh-huh uh-huh) I like it (uh-huh uh-huh)“. It has always been our long term plan. This is not to say that I oppose women in the workplace; she had a job for most of the eight years that we lived in England before moving to the States in 1995, but those were jobs, not a career. While a little extra money would not go amiss, she brings far more value and quality to my life by staying home than she would if she worked. She does not have a college education, and yet she is the smartest woman I know. She is truly a Proverbs 31 woman. But then I would say that; I’m biased, and proudly so. Our home is an oasis of calm and tranquility from the slings and arrows of a tumultuous, tempestuous world. In many ways our home is a spiritual sanctuary. We rarely go on vacation; our home life is so enjoyable, we don’t feel the need to “get away from it all” as much as others may. The overwhelming majority of the food we eat is home-cooked from scratch; I cannot remember the last time I had a frozen meal that came out of a box. People say that we look impossibly young for a couple with over a quarter-century of marriage under our belts. I credit her with my health, my youth and my creativity. We may never be as wealthy as our two-income friends, but we are content. I paid little attention when Ray Rice, the Football player, got plastered all over the news earlier this year for beating up his girlfriend, Janay, and the media went nuts; I do not follow sports and celebrity gossip means nothing to me. What, exactly, did *she* do to provoke that kind of reaction from *him*? It can’t have been that bad – she married him afterwards, didn’t she? When I was a boy, my brother and I used to fight, as boys are wont to do. Since I was far bigger than he, my parents instructed me “Don’t hit your brother”, as parents are wont to do. One sunny afternoon, we were playing in the garden when he started hitting me. At first I ignored him, but eventually I gave him a half-hearted swat. He immediately went running indoors with tears in his eyes “Muuuuuuum! He hit me! Tell ‘iiim!”. Fortunately for me, our mother had seen the entire production and called him out on it. His crocodile tears dried up with alacrity, and he said “You didn’t say I couldn’t hit him”. That is the unfortunate state of affairs between men and women in the western world today. Women are allowed to hit men with impunity, but the moment he even attempts to defend himself, he is immediately in the wrong. When Solange Knowles blatantly assaulted Jay-Z in that that infamous elevator video, he made no attempt to defend himself; he knew that if he had done so, he would be up on charges – and Solange knew that as a woman she was effectively immune from criticism. Had the situation been reversed, he would have been arrested and incarcerated as a matter of course. Indeed, thanks to the “Violence Against Women Act” (VAWA) passed during the Clinton Administration, police officers in many areas are instructed to routinely arrest the man in Domestic Violence disputes – even if he is clearly the victim. Let me stop right here and state clearly that I do not condone domestic violence. However, there are two sides to every story; three, if you include “The Truth”. But statistics show that the majority of Domestic Violence incidents are started by the woman. A fundamental lesson of manhood is “Never start a fight – but always finish it”. But what’s a man to do if the aggressor is a woman? Ray and I were bickering. We were drunk and tired… As we were arguing… I went to reach for his phone, and when he grabbed it back, he spit at me and I slapped him… We got into the elevator and what happened inside is still foggy to me. The only thing I know – and I can’t even say I “remember” because I only know from what Ray has told me – is that I slapped him again and then he hit me…. The next thing I do recall is being in the casino lobby, surrounded by cops. Aaaand there it is… the cold hard truth – she hit him first. The man-haters out there would like to believe that woman good, man bad. But contrary to much of the yammering in the media, most men do not go through life looking for an excuse to hit women. In fact, most men have a protective instinct towards woman – an instinct which, I have found out from personal experience, some women simply do not appreciate. Another thing that too many women do not appreciate is the fundamental nature of men. We have been designed and sculpted by evolution to confront and overcome danger and adversity. We still have that Cave-dweller living in our heads. And when we are roused to action, adrenaline multiplies our strength, sharpens our reflexes and short-circuits our thinking process to the singular task of fighting – to the death if necessary. But being hard-wired for fight-or-flight is not much use when confronted by sharp-tongued, confrontational, aggressive or nagging women. Walking away is cowardice, hitting them, as we have already established, is abuse. So what’s a man to do? Interestingly, nagging, haranguing, annoying behavior is not a crime – unless a man does it to a woman, in which case it is relabeled “Psychological abuse”, and it’s off to jail with you, Sir.. For too many women this is Standard Operating Procedure. For too many men it is “Damned if you do, damned if you don’t”. One lamentable side-effect of the climate of fear and stress in which we live is that men are now actively suppressing the natural urge to help women, because too many men have found themselves jailed, injured or dead for “doing the right thing”. We men are now learning that discretion is often the better part of valor – to the detriment of women everywhere. Man hits man twice his size and gets knocked out = Idiot. Woman hit man THREE times her size and gets knocked out = Victim. How’s that equality stuff working out for you, ladies? Rule 1: A gentleman never hits a lady. Rule 2: A woman who hits a man is not a lady. She therefore cannot claim the protection of Rule 1. Here’s a revolutionary idea: if you want your man to act like a gentleman, learn to act like a lady. A man instinctively knows not to pick a fight with another man twice his size. Yet thanks to the laws of the land and the current political climate, a woman can pick a fight with a man three times her size who is capable of easily killing her with one blow, safe in the knowledge that she can put him in jail if he retaliates or even tried to defend himself. Whoopi Goldberg made this surprisingly commonsensical point on “The View” (to the annoyance of the female presenters, and to the delight of the mostly-female audience) and this is one of the few times that I have ever agreed with her on anything. Ladies, the lesson is a simple one: Don’t Poke the Bear.